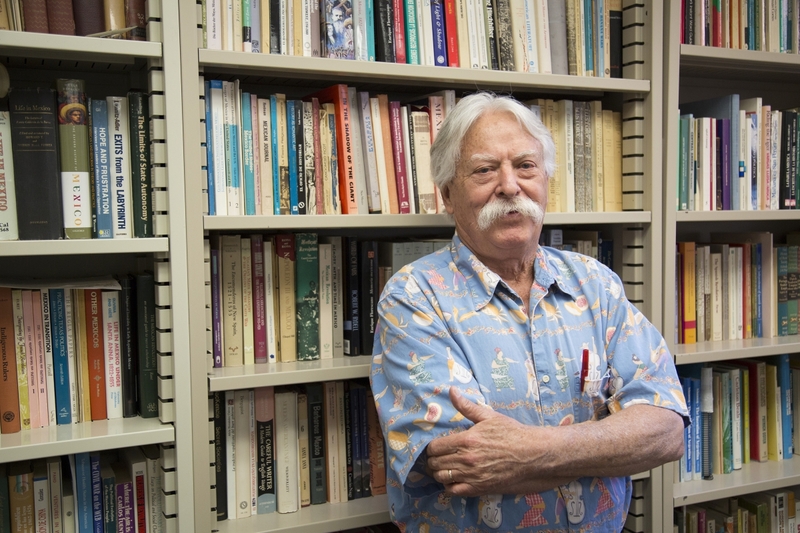 UA professor of history William Beezley has joined the ranks of prominent artists, politicians and athletes to receive the Ohtli award, the highest recognition granted by the Mexican Government outside of Mexico. Beezley has served as a professor in the UA’s Department of History since 1998, during which time he earned an international reputation for his investigations of Mexico’s history. A recognized name in scholarly circuits, Beezley has written or edited dozens of publications, including the classic “Judas at the Jockey Club” and the fundamental anthologies “A Companion to Mexican History and Culture” and “The Oxford History of Mexico,” edited with Michael C. Meyer. Beezley was drawn to themes of social change, but this wasn’t the primary reason he became a historian. “That happened because I was not good enough at chemistry to become a botanist,” he said. The Mexican Ministry of Foreign Affairs typically presents the Ohtli award to members of the Mexican-American community who promote Mexican culture, but they deemed Beezley’s contributions to the field so great, they bestowed upon him the honor. 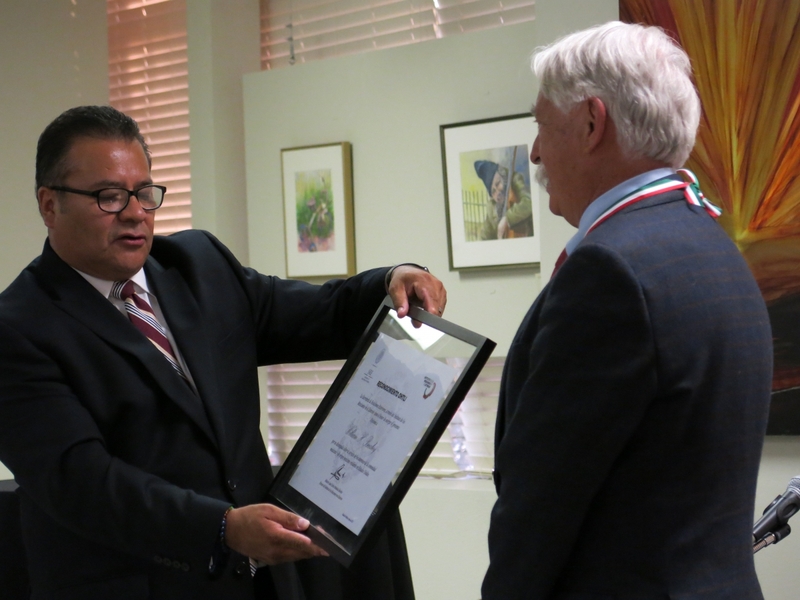 "The Government of Mexico awarded Dr. Beezley the Ohtli prize as a recognition of his countless works about the history of Mexico, its people, its culture and its traditions, which have been instrumental in bringing a better understanding between our two countries,” said Ricardo Pineda Albarran, consul of Mexico in Tucson. The Ohtli award recognizes individuals for devoting their professional lives to forging a new path for Mexican nationals abroad, hence the name Ohtli, a Nahuatl word meaning road or pathway. Previous winners include Congressman Raul Grijalva, actress Eva Longoria, music producer Emilio Estefan and legendary baseball player Fernando Valenzuela. “We are proud that History Professor Bill Beezley was selected to receive the prestigious Ohtli award,” said John Paul Jones III, dean of the College of Social and Behavioral Sciences. Having appeared as a guest expert in more than 20 PBS episodes of “The Desert Speaks” and “In the Americas with David Yetman,” Beezley is also a familiar face in many American households. He is currently interviewing former Mexican presidents for a film series on the democratization of Mexico. “I find delight in talking to Mexicans and Latin Americans of all social groups about their lives, interests, hopes and passions— on television or video really doesn't matter, but listening to what individuals have to say does,” explained Beezley. This notion resonated with Luis Coronado Guel, a research associate with the College of Social and Behavioral Sciences Mexico Initiatives, a program geared toward collaborating with Mexican institutions. “As his former student, I experienced first-hand his total devotion and passion for Mexico. But the primary reason I nominated Dr. Beezley for the award was because he transformed the way I look at my own country,” said Guel. Beezley considers the UA an ideal place to give that voice to those who were forgotten throughout history. 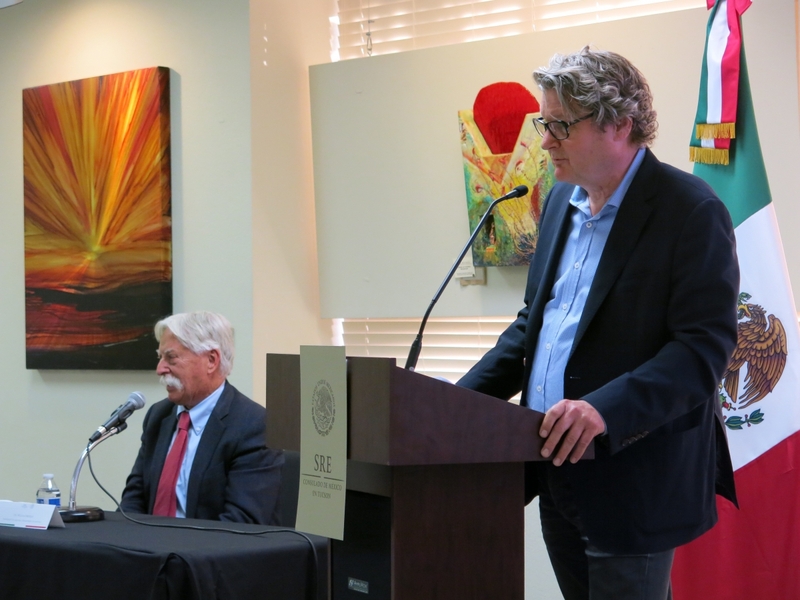 “The faculty here has such diverse interests in Mexican history, and the interactions of all kinds along and across the border makes it easily one of the top three or four universities in the United States for Mexican and Latin American studies,” he said. The UA’s cooperation with the National Autonomous University of Mexico or UNAM, of which a satellite campus was born, gives Beezley hope that the Department of History will grow even stronger. “As a result of the UNAM-UA alliance, the UNAM office on campus and Mexico Initiatives at the College of Social and Behavioral Sciences, the opportunities for students and faculty will increase substantially,” he explained.